Eddie Brock and the symbiote from Klyntar. The two go together like peanut butter and jelly, Han Solo and Chewbacca, macaroni ‘n’ cheese. You can’t really have one without the other… can you? Say what you will about them, but their bond is just as strong as one forged by romance and love. They even have lovers’ quarrels every once in a while. Yes, sadly, the two “buddies” have been separated several times over the years and it’ll play out again in VENOM #12 from Donny Cates and Ryan Stegman, on sale today. Without the symbiote, Eddie’s just a normal man dying from cancer. Looking for answers, he turns to the Maker, who may be able to help him out of this sticky spot (pun intended). Before that meeting takes place, however, here are a few times Eddie and his sharp-toothed alien counterpart were removed from one another, either by choice or by circumstance. 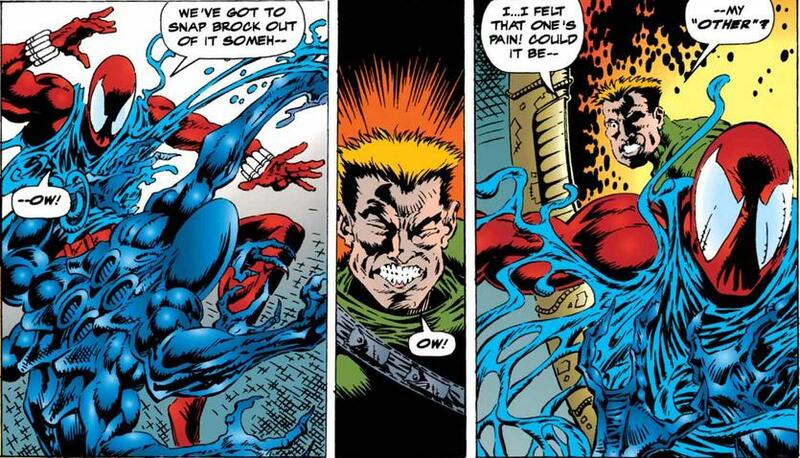 In 1994’s SPIDER-MAN #53, the Scarlet Spider (A.K.A. Ben Reilly) succeeded in subduing Venom by separating the symbiote from Eddie Brock. The hero achieved this by shooting some Impact Webbing straight into Venom’s mouth. Once they exploded within, they expanded and pushed the cosmic costume away from Brock’s body. The symbiote, now all on its own, prepared to defend Eddie, but realized it could achieve symbiosis with Reilly, who rejected the bond. The symbiote collapsed, too weak to go on, and the Guardsmen then arrived to take it and Eddie away. The Scarlet Spider’s defeat of Venom helped lead into the SEPARATION ANXIETY storyline, when Eddie and the symbiote pined for one another. Brock was in chains in New Mexico while the alien was being held in a test tube at a top secret government facility in the Adirondack Mountains. The government, as usual, was overjoyed to have an alien specimen to study and torture. Luckily, the time away from the symbiote actually gave Eddie a chance to reflect on his misdeeds as Venom and realized that his quest to kill Spider-Man got other people hurt in the process. 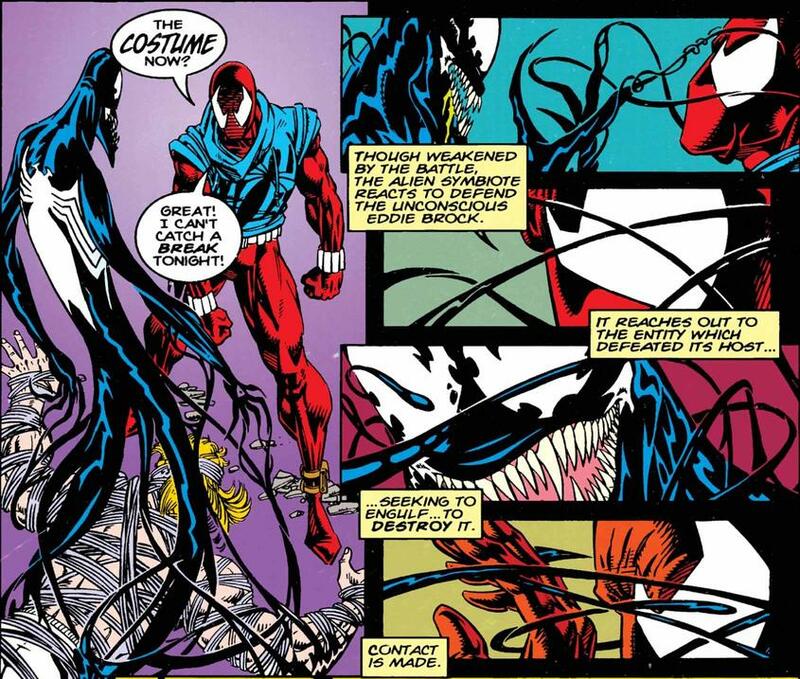 Even so, Eddie eventually had to reunite with his symbiote in order to defeat a number of other rogue symbiotes that were running rampant, so this breakup didn’t last. 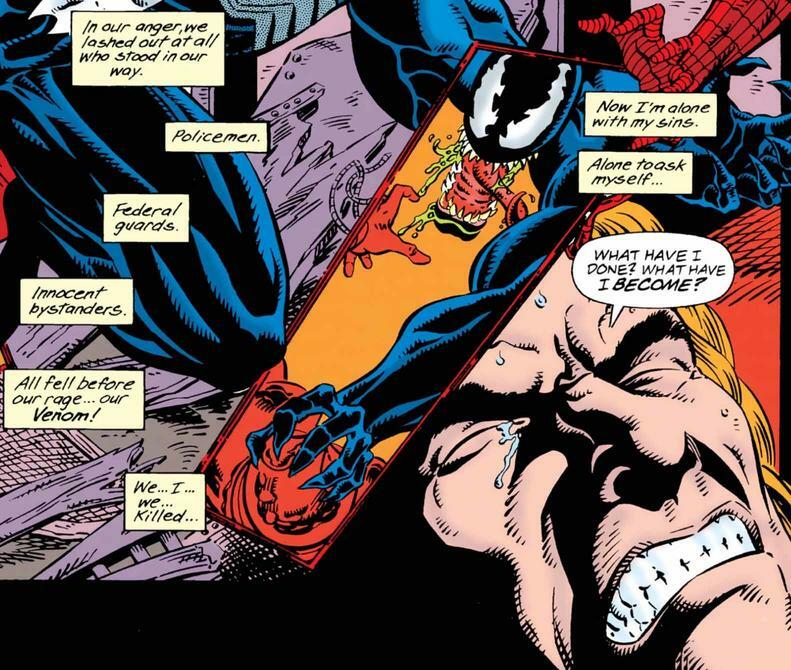 While not technically a separation of human and symbiote, the LETHAL PROTECTOR arc involved a separation from Venom’s toxic ideals that he held for so long. In the opening pages, Eddie and the symbiote had a tête-à-tête about how they used to hate Spider-Man for ruining their lives. After Eddie moved to San Francisco to turn over a new leaf, he and the symbiote decided to help protect the innocent as Venom and even realized that “in his own twisted way,” Spider-Man was doing the same thing. Once again realizing that the symbiote was influencing him to harm others (not to mention commit murder), Eddie sent the symbiote away, essentially breaking up with it and telling it to leave. He revealed this to Spider-Man and Scarlet Spider, but became concerned when it seemed like the symbiote had bonded with someone else, continuing the same murderous rampage in a different body. As a result, he decided to take responsibility and track it down. Eddie formed an alliance with the two Spider-People and fought against the symbiote, which had attached itself to an unwilling participant. This struck Eddie as strange since his “Other” would never bond with a human unless that person was totally willing. Finally, the trio discovered that it was not the Venom symbiote causing the raucous, but a rogue symbiote, which was part of a larger group of symbiotes trying to take over the planet. A showdown in Upstate New York transported Eddie, Spider-Man, and Scarlet Spider to another planet overwhelmed by symbiotes. Before they could be defeated, Eddie’s “Other” (wrapped around Ben Reilly) revealed itself and helped them escape. 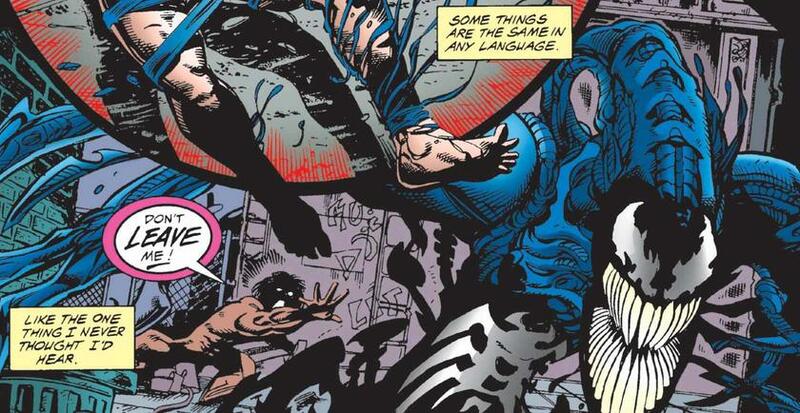 After they’d gotten out of harm’s way, Eddie spoke to the symbiote, saying: “We need to talk.” That’s never a good sign. 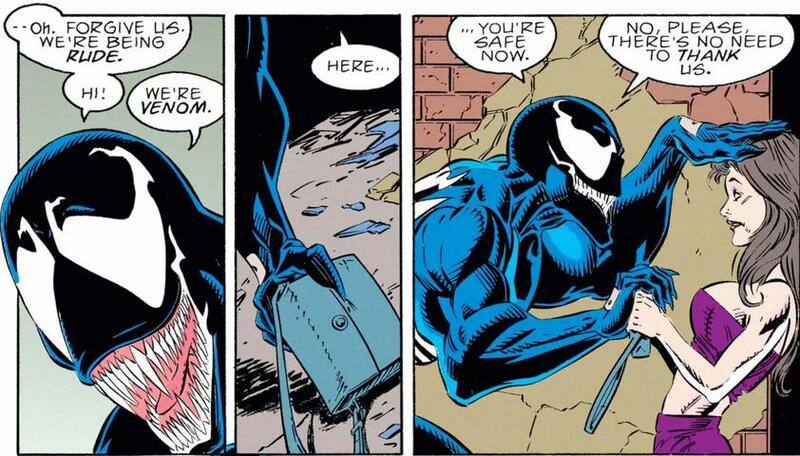 Undeniable proof that Eddie and the symbiote’s relationship is just like any other romantic partnering. Sadly, Eddie was then institutionalized and branded as crazy when he tried to warn everyone that the symbiote would kill them all for food. 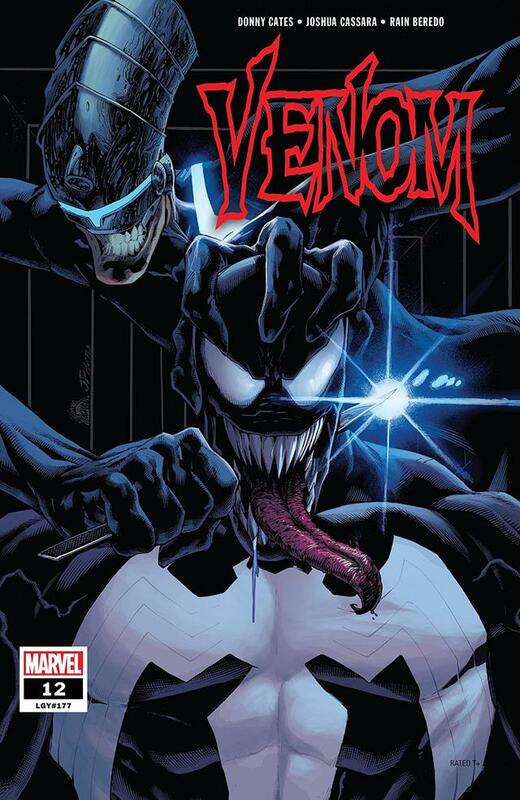 VENOM #12, written by Donny Cates with art by Ryan Stegman, is available now online and at your local comic shop.